St. Irenaeus of Lyons quotes. June 28: Saint Irenaeus of Lyons. June 28: Saint Irenaeus of Lyons. Bishop and Martyr, writer, theologian, defender of the faith, and Doctor of the Church. 3-When we stand in the light it is not we who illumine the light and cause it to shine but we are illuminated and made shining by the light… God grants his blessings on those who serve him because they are serving him and on those who follow him because they are following him, but he receives no blessing from them because he is perfect and without need. 4- Because of his boundless love, Jesus became what we are that he might make us to be what he is. 6-But following the only true and stedfast Teacher, the Word of God, our Lord Jesus Christ, who did, through His transcendent love, become what we are, that He might bring us to be even what He is Himself. 7- And when we come to refute them, we shall show in its fitting place that this class of men [i.e., the gnostics] has been instigated by satan to a denial of that baptism which is regeneration to God, and thus to a denial of the whole faith (by denying all physical aspects of spirituality, including the incarnatian and bodily resurrection of Jesus). 8- The church has been planted as a paradise in this world. 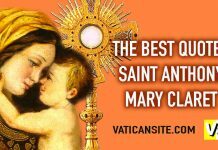 9- It is not necessary to seek the truth among others which it is easy to obtain from the Church; since the apostles, like a rich man [depositing his money] in a bank, lodged in her hands most copiously all things pertaining to the truth. 10- A man that is an heretic, after the first and second admonition, reject; knowing that he that is such is subverted, and sinneth, being condemned of himself. 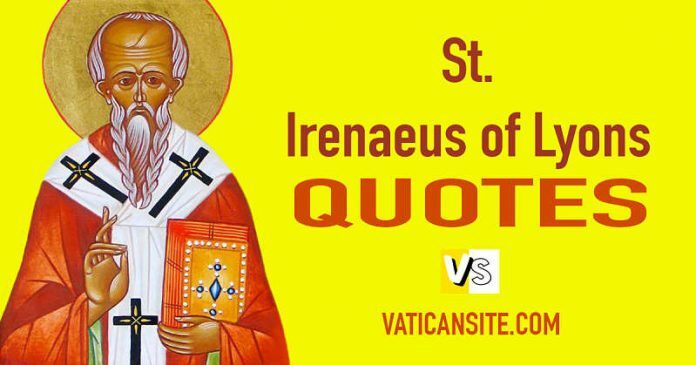 Saint Irenaeus was born around the year 130. Educated in Smyrna, he became the disciple of Saint Polycarp, bishop of that city. 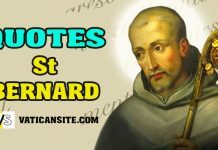 In the year 177 he was ordained a priest in Lyons in France and shortly thereafter was made bishop of Lyons. 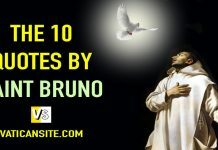 He composed works defending the Catholic faith against errors of the Gnostics, and it is said that he received the martyr’s crown around the year 200.